Monitoring and understanding of greenhouse gas emissions and sediment dynamics in shallow water bodies. My primary interests are in monitoring and understanding biogeochemical processes within shallow water ecosystems. My formal training was in biochemistry and marine biology focusing on Southern Ocean food webs. Subsequently, I have focused on monitoring sediment loading and greenhouse gas emissions from sub-tropical coastal and freshwater systems. I joined the School of Civil Engineering in 2007 to work in the area of sediment biogeochemical cycling in freshwater storages and coastal lagoons. In order to better understand these processes it is critical to monitor overlying water column processes as well as catchment interactions. Therefore, my primary research activities have been in the developing novel monitoring systems of catchments and their receiving water bodies. Cossu, Remo, Heatherington, Craig, Grinham, Alistair, Penesis, Irene and Hunter, Scott (2018). A cost-efficient seabed survey for bottom-mounted OWC on King Island, Tasmania, Australia. In: 4th Asian Wave and Tidal Energy Conference. Asian Wave and Tidal Energy Conference, Taipei, Taiwan, (). 9-13 September 2018. Beecroft, Ryan, Cossu, Remo, Grinham, Alistair, Wilson, Craig and Maxwell, Paul (2018). Monitoring dredge placement operations through long-term and fine-scale suspended sediment observations within a shallow coastal embayment. In: Book of Abstracts: 34th PIANC World Congress. PIANC World Congress, Panama City, Panama, (386-386). 7-11 May 2018. Penesis, Irene, Hemer, Mark, Cossu, Remo, Hayward, Jenny, Nader, Jean-Roch, Rosebrock, Uwe, Grinham, Alistair, Sayeef, Saad, Osman, Peter, Marsh, Philip and Couzi, Camille (2018). Tidal energy in Australia – Assessing resource and feasibility to Australia’s future energy mix. In: 4th Asian Wave and Tidal Energy Conference. Asian Wave and Tidal Energy Conference, Taipei, Taiwan, (). 9-13 September 2018. Beecroft, R., Perez, L., Grinham, A., Visscher, J., Hildebrandt, A. and Cossu, R. (2017). Sediment concentration profiles and transport dynamics near the Port of Brisbane, Moreton Bay, Queensland. In: Coasts & Ports 2017 Conference. Australasian Coasts & Ports Conference, Auckland, New Zealand, (68-74). 21-23 June 2017. Grinham, Alistair and Dunbabin, Matthew (2014). Herds of methane chambers grazing bubbles. In: 11th EGU General Assembly: Conference Abstracts. EGU2014: 11th European Geosciences Union General Assembly 2014, Vienna, Austria, (1-1). 27 April-2 May, 2014. Sturm, Katrin, Grinham, Alistair, Werner, Ursula and Yuan, Zhiguo (2014). Tidal inﬂuence on subtropical estuarine methane emissions. In: 11th EGU General Assembly: Conference Abstracts. EGU2014: 11th European Geosciences Union General Assembly 2014, Vienna, Austria, (1-1). 27 April-2 May, 2014. Musenze, Ronald, Grinham, Alistair, Werner, Ursula, Udy, James and Yuan, Zhiguo (2013). Methane and nitrous oxide emissions from coastal, estuarine and freshwater systems in subtropical Australia. In: EGU General Assembly 2013. European Geosciences Union General Assembly 2013, Vienna, Austria, (6725-6725). 7-12 April 2013. Grinham, Alistair, Dunbabin, Matthew and Yuan, Zhiguo (2013). Methane bubbling: from speculation to quantification. In: American Geophysical Union (AGU) Fall Meeting 2013, San Francisco, CA, USA, (). 9-13 December, 2013. Aryal, R., Grinham, A. and Beecham, S. (2013). Modelling of physicochemical processes in Lake Wivenhoe during a flood period. In: J. Piantadosi, R. S. Anderssen and J. Boland, MODSIM 2013: 20th International Congress on Modelling and Simulation. 22nd National Conference of the Australian Society for Operations Research - ASOR 2013. DSTO led Defence Operations Research Symposium - DORS 2013. Abstracts. MODSIM 2013: 20th International Congress on Modelling and Simulation, Adelaide, SA, Australia, (388-388). 1-6 December, 2013. Sub-tropical freshwater storage catchments: major greenhouse gas sinks? Grinham, Alistair and Dunbabin, Matthew (2013). Sub-tropical freshwater storage catchments: major greenhouse gas sinks?. In: EGU General Assembly 2013. European Geosciences Union General Assembly 2013, Vienna, Austria, (). 7-12 April 2013. Subtropical freshwater storages: a major source of nitrous oxide and methane? Sturm, Katrin, Grinham, Alistair and Yuan, Zhiguo (2013). Subtropical freshwater storages: a major source of nitrous oxide and methane?. In: EGU General Assembly 2013. European Geosciences Union General Assembly 2013, Vienna, Austria, (). 7-12 April 2013. Dunbabin, Matthew, Grinham, Alistair and Udy, James (2009). An autonomous surface vehicle for water quality monitoring. In: Proceedings of the 2009 Australasian Conference on Robotics & Automation. Australasian Conference on Robotics and Automation 2009, Sydney, Australia, (). 2-4 December 2009. Gale, Deb, Grinham, Alistair and Udy, James (2009). 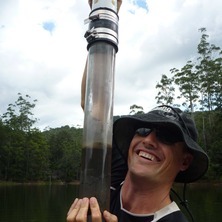 Using diatom community structure to assess freshwater reservoirs in South East Queensland, Australia. In: Bart Van de Vijver and Christine Cocquyt, Diatom Taxonomy in the 21st Century in Honour of Henri Van Heurck: Programme & Abstracts. Symposium on Diatom Taxonomy in the 21st Century in Honour of Henri Van Heurck, Meise, Belgium, (35-35). 23-26 August 2009. Microphytobenthos composition in Heron Reef, Australia, by High Performance Liquid Chromatography (HPLC) (July 2012). Grinham, Alistair Robert (2007). Downstream effects of land use on shallow-water benthic microalgal communities in Moreton Bay, Australia and Marovo Lagoon, Solomon Islands PhD Thesis, School of Engineering, University of Queensland. Investigating the distribution of indurated sands near Bribie Spit and its implication for beach erosion.